PREREQUISITES: None. This is the basic course for workers new to the field of hazardous waste. DOES YOUR WORK AREA HAVE HAZARDOUS WASTE MATERIALS? If your job duties require that you help with the clean-up of a hazardous waste site, chemical spill, natural disaster or even a drug lab you and your employees are required to complete OSHA HAZWOPER training, pass an exam and earn a certification. You’ll need to complete an initial round of training before you can work in an environment that includes hazardous materials or waste or complete your introductory training within a set time period after you’re hired. DOES YOUR JOB REQUIRE AN OSHA 24-HOUR HAZWOPER OCCASIONAL SITE WORKER CERTIFICATE? You don’t need to be a permanent employee of a given organization to need OSHA 24-hour HAZWOPER training to do your job. Professionals like architects, mechanical engineers and environmental engineering technicians who visit various work sites as part of their jobs may also have to undergo this kind of training to work at locations where hazmat is present. DO YOU OCCASIONALLY WORK WITH OR ARE IN CONTACT WITH HAZARDOUS WASTES? Just like you don’t need to be a permanent employee of a business that has hazmat present to need HAZWOPER training, a given jobsite also doesn’t need to have a permanent supply of hazardous waste or materials on hand for this sort of training to be necessary. Even if you only work or come into contact with hazardous waste and materials occasionally, you’re still required to complete our OSHA 24-hour HAZWOPER course for site workers. “The text was easy to read and understand. I really liked the interaction with the instructor via email. Further, if you regularly work with hazardous materials in almost any capacity and have never been exposed to HAZWOPER training or learned about OSHA standards, the 24-Hour HAZWOPER courses provide you with all the information that you will need to work safely with these materials. We cover safety, emergency response, and regulatory compliance information to give students the tools they need to competently assess, manage, and solve real life situations. 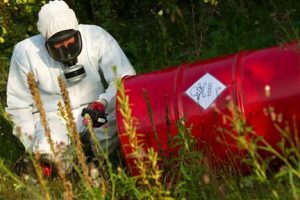 Many organizations mandate HAZWOPER training for employees whose job requirements involve the handling, storage, transportation, or use of hazardous materials and wastes. Simply put, if you work with hazardous substances in the workplace, you will benefit from this program. If you’ve never worked in a place where hazmat was a concern, you might be unfamiliar with the many industries that require employers and employees to complete OSHA 24-hour HAZWOPER courses and earn a certification. Being familiar with these industries is important because that knowledge may help you launch or transition into a new career. If you do choose to seek a job with a company that either responds to chemical spills, performs clean-up operations at a Superfund site or drug labs or are helping with the clean-up from a natural disaster you can get the necessary training by signing up for 24-hour HAZWOPER training online at Hazmat School. Whether you want to break into an industry that deals with hazardous materials or you already work in such an industry, at least on occasion, you needn’t look beyond Hazmat School to find site worker HAZWOPER 24-hour online courses. This course covers all the information you’ll need to know to satisfy OSHA’s mandated training requirements. Our OSHA 24-hour HAZWOPER training is available to individuals and groups. If you’re a government employee or you establish a corporate or group account, you may be eligible for a discount of up to 20 percent. While our prices are already more than competitive, saving 20 percent per course can add up quickly if you have a large group of enrollees. To learn more about our affordable training courses or to see if you qualify for a discount, contact Hazmat School. Our Online 24 Hour HAZWOPER training certification course fulfills your requirements for certification under 29 CFR, Part 1910.120 (e), or other applicable state regulations for certification to the 24-hour Occasional Site Worker level. Receive 2.4 CEUs and an OSHA 24 Hour HAZWOPER Certificate documenting compliance with the OSHA requirement for classroom training. Meet the requirements for certification of 29 CFR, Part 1910.120 (e) or other applicable state regulations for certification to the 24-hour Occasional Site Worker level. Understand the various training regulations relating to hazardous materials handling and response. Know which activities can be performed at what level of certification. Demonstrate knowledge of the types of hazardous materials and the various hazards and risks associated with them. Demonstrate knowledge of the routes of entry for hazardous materials to enter the body. Demonstrate an understanding of the health effects that hazardous materials can have on the body. Demonstrate an understanding of the terminology used in describing hazardous materials including vapor density, specific gravity, miscibility/solubility, carcinogen, teratogen, mutagen, pH, PPM, TLV, IDLH, flammable/explosive range, combustible, flammable, flash point, and ignition temperature. Demonstrate an understanding of the primary identification systems including the Department of Transportation (DOT) system, National Fire Protection Association (NFPA) 704 system, and Hazardous Materials Information System (HMIS). Understand the need for personal protective equipment when using hazardous materials. Identify the levels of protective clothing used in hazardous waste operations. Demonstrate an understanding of the need for respiratory equipment and of the advantages and disadvantages to the types of respiratory equipment. Review work practices that can be used to minimize the risks commonly found at waste sites. Review the safe use of engineering controls in the elimination and control of hazards. Demonstrate an understanding of the importance of decontamination and of the types of decontamination practices commonly used at waste site activities. List the hazards of confined space operations and the types of procedures to minimize them. Review activities related to containment of spills to minimize their effects on personnel and the environment. Students will have to go through all modules in order to unlock the final exam at the end of the course. You will need a computer or iPad with Internet access and an email account. No text is required; all course materials are available online. The course will take approximately 24 hours to complete but you can come and go as you need. The course is designed to be self-paced. You will have 90 days to complete it and can come and go as you need. After three months, you will need to re-enroll. Featuring interactive exercises, industry-specific examples, and audio narration, this course will help you learn everything you need to know about hazardous material management and the hazardous waste regulations that are set by OSHA and other federal safety agencies. Upon successful completion of the course, you will receive a pdf certificate right away. If you work in an environment where hazardous materials are present and require fast and thorough hazmat certification, we have the right courses for you. All of our courses provide training that fully satisfies OSHA, DOT, and EPA requirements. You will graduate with the confidence and skills you need to avoid fines, citations, and workplace injuries. Serving more than 20,000 students every year, our friendly, professional instructors go above and beyond to ensure each student receives an amazing and memorable learning experience on the road to certification and workplace safety. Hazmat School’s online training solutions are designed to build a comprehensive safety culture and meet your organization’s compliance goals at the best value for your money. To enroll in your next course, give us a call at 877-OSHA-NOW (674-2669). We are also available to answer any questions or comments. We look forward to hearing from you!